What A Pretty (Sunless) Tan! Unfortunately, I've had to discontinue this product. I hope this will just be temporary. I am having difficulty locating a supplier for DHA. Hopefully, I will be able to find one soon, because I use this product myself! What A Pretty (Sunless) Tan! was formulated because of my own need for a facial self-tanner that would not irritate my skin and cause breakouts. It does not contain pore-clogging ingredients, nor does it contain added fragrance or dyes. 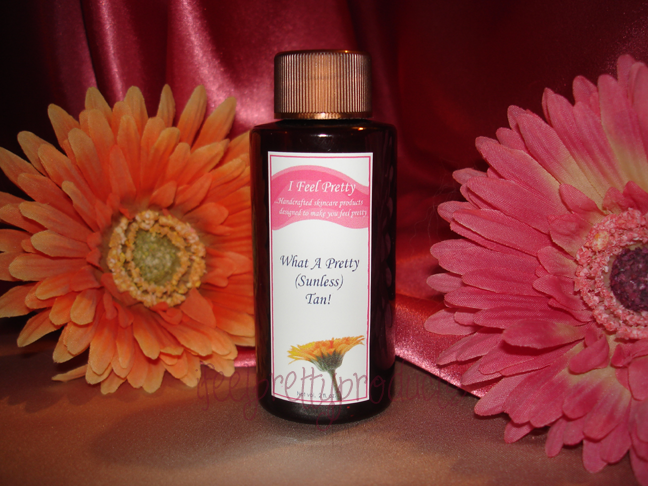 It does contain antioxidants and other ingredients that can soothe the skin. This product contains 10% DHA, but does not tan as darkly as most other 10% products. How to use: Click here for complete product instructions. I really only recommend this product for facial use - you can use it on other parts of the body, but application may be difficult because of the consistency of the product. Shelf life: 4-6 months - longer if kept in the refrigerator or a cool, dark place. Ingredients: water, dihydroxyacetone, aloe barbadensis leaf juice, pentylene glycol, tamarind seed extract, hydrolyzed oats, glycerin, gingko biloba leaf extract, olive leaf extract, rooibos leaf extract, white tea leaf extract, and green tea leaf extract, propylene glycol, diazolidinyl urea, & iodopropynyl butylcarbamate. Green, white, & rooibos tea extracts - contain free radical scavengers that inhibit oxidation that can damage skin cells; also have anti-inflammatory properties. Olive leaf & gingko biloba extracts - contain free radical scavengers that inhibit oxidation that can damage skin cells; also have anti-inflammatory properties. Hydrolyzed oats - studies have shown that hydrolyzed oats retain significantly more moisture and even gain up to 50% more moisture at relative low humidity. Tamarind seed extract - studies have shown that tamarind seed extract significantly improves skin elasticity, hydration, and smoothness - it has even been found to outperform hyaluronic acid in moisturization. Aloe - has skin soothing properties. Copyright © 2006-2015: I Feel Pretty. All Rights Reserved.